A lovable puppet and a cuddly blanket all in 1! Machine wash and dry. The plush puppet will keep kids entertained all day and the snuggly blanket will keep them warm all night. Opened 39"L x 28"W. Polyester. Makes the perfect gift! Imported. What do you get when you cross a cuddly blanket creating use of a cute puppet? It will entertain your child all day, after which become their warm and fuzzy friend at night. Cuddle Uppets come in assortment of colorful animal types. 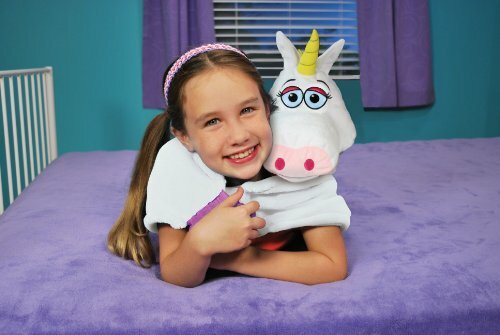 The Cuddle Uppets Magic Unicorn is easily washable, so kids can take it anywhere and not worry about getting it dirty. You get a Cuddle Uppets, the blanket that's a puppet. Let this soft Magic Unicorn cuddle, hug, and wrap your youngster in love with its 39- by 28-inch (L x W) blanket. Play all day and sleep the night away with Cuddle Uppets. Washable for Worry Free Play and Travel View larger.